Questions have been raised as to whether the number of elections analyzed is sufficient to draw conclusions. Given that approximately 20 million votes in 13 elections have been analyzed, the results are statistically significant. The analysis is confirmed by other forensic methods (True Vote Model, exit polls) for competitive and non-competitive races. The analysis of cumulative vote shares (CVS) has revealed a consistent pattern. It is a well-known fact that Democrats are the majority in highly populated urban locations; the largest precincts are usually Democratic. Republicans are heavily represented in rural areas. But in scores of state elections there has been an increase in cumulative Republican vote shares in larger precincts. This anomaly has been noted by PhDs in Kansas and Vanderbilt University. The basic premise is that Republican increase in cumulative precinct vote shares is counter-intuitive since the Democrats do much better in urban and suburban counties than in rural areas where the GOP is dominant. Precincts in Urban areas contain more voters than rural areas. Since the GOP gains share in Democratic locations in virtually all of the competitive elections analyzed, it is highly suggestive evidence that Democratic precincts are where the majority of votes are stolen. In competitive elections, the correlation between county/precinct vote-size and the change in Democratic vote share is negative; Democrats lose share as county/precinct size increase. On the other hand, in non-competitive races, the Statistical correlation is close to zero; there is virtually no relationship. The numerical evidence in each election is clear. 1- In the 15 largest counties, Republican vote share increases from the 25% mark to the final. 2- In the other smaller counties, there is virtually no change in vote share from the 25% mark. 3- In counties where the Democrats led at the 25% mark, their vote share declined significantly. This post links to CVS blog posts and related spreadsheets. View the CVS Summary graph. On Nov. 5, 2015 I posted this CVS analysis for the KY Governor race. We see the same counter-intuitive vote shares in the largest counties. SD Gov: Daugaard (R) won by 70.5-29.4%. Note the slight 0.49% change in vote shares. KS senate: the Independent lost by 53.2-42.2% but nearly tied the Republican in the Top 15 counties (618,000 votes). In the other counties (264,000 votes), he lost by 64.3-31.3%. In the Maryland election, Hogan (R) defeated Brown (D) by 65,000 votes (51.7-47.2%). But Brown won the 301,000 early and 83,000 late votes (absentee and provisional paper ballots) by 53.9-44.5%. Hogan led on Election Day voting machines (1,319,000 votes) by 52.9-45.3%. This anomaly also occurred in the 2000-2012 presidential elections. The Democrats did much better in early and late voting. In 2012 Obama led in early voting (40 million) by 55-43%; he led in late voting (11.7 million) by 58-38%. He lost to Romney on Election Day (77 million) by 50.4-47.9%. Additional proof of Governor election fraud is that Exit polls (check Party_ID) are always adjusted to match the recorded vote. – A Vanderbilt Univ. statistical study of precinct level data in US presidential elections reveals a correlation of large precincts and increased fraction of Republican votes. – Wichita State University engineering professor and statistician Beth Clarkson has accused three states — Wisconsin, Ohio, & Kansas — of voting irregularities that indicate a tampering of electronic voting machines. Cumulative Vote Share (CVS) anomalies were noticed in a 2005 Ohio special election election favoring Schmidt (R) and in the 2012 GOP primaries favoring Romney. Michael Collins wrote this article on the 2005 race: “Richard Charnin, posting as TruthIsAll, first noted the pattern with an analysis of the 2005 special election for a vacated seat for Ohio’s 2nd district, in the House of Representatives. The candidates were the liberal-populist Democrat Paul Hackett versus a right-wing Republican, Jean Schmidt. Charnin noticed that Schmidt’s votes and percentages increased substantially from the smallest to largest precincts in that district. This was a patently absurd pattern of vote accumulation since the liberal Hackett wins were in highly conservative counties that rarely voted for any Democrat. Precincts with the most votes favored Schmidt at nearly 100%, with Hackett winning in only those with less than 200 votes counted. A review of precinct level results by Charnin on Democratic Underground reveals this interesting trend. This data is preliminary and more detail needs to be obtained from the Clermont Board of Elections. However,the data observed for Clermont makes little sense on the face of it. These results raise interesting questions. 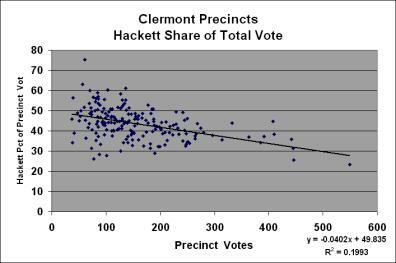 Why does Hackett do much better in the smaller precincts? Are they more rural than the larger precincts? If so, does this not present a counter-intuitive pattern, with the Democrat taking some of the conservative, less populated areas and the Republican winning all of the precincts in the most populated areas? A question can be raised about the difference between turnout (the votes cast) and the actual size of the precinct, which may or may not be a reflection of votes cast. The following graph, also produced by Charnin, answers the question. Collins also wrote a two-part article on the 2012 GOP primaries in which a CVS analysis showed a consistent pattern of votes being flipped to Romney. “Part I of this series suggested that there may well have been massive vote flipping for candidate Mitt Romney in the Republican primaries (Rigged Elections for Romney (10/22/12) The article and the initial research analysis were received broadly. In addition, highly motivated citizens across the country and a team of high school students contacted the authors for help replicating the research in their states. The researchers, Francois Choquet et al., point out that this can be done with their open source techniques. Simon discusses another kind of evidence pointing to suspicious election outcomes. “The evidence is based on a method called “cumulative vote share” (CVS) analysis in which a graph is made for county results that shows the cumulative vote percentage by adding in precincts according to the precinct size, with the smallest precincts included first. According to statistical theory, the resulting graph should look something like the following result for DuPage County in the 2014 Illinois Governor race. Note: these graphs were produced by Richard Charnin and presented at his web site.